The origin of the Ciacci Piccolomini d'Aragona estate dates back to the 17th century. Located in southeastern Montalcino in the beautiful village of Castelnuovo del Abate, it has breathtaking views of the Orcia valley and Mount Amiata. The oldest part of the property is the Palazzo (meaning Palace), erected by Montalcino's bishop, Fabivs de Vecchis, Abbot of Sant Antimo Abbey. Over the course of time, the Palazzo became the property of the Montalcino diocese and was auctioned according to Italian law regarding ecclesiastic property. In 1877, Francesco Ciacci, head of a Castelnuovo-based family, purchased the property from the Church. In the mid-1900s, the historical “Palazzo del Vescovo” became known as the Palazzo Ciacci Piccolomini d'Aragona after the marriage between count Alberto Piccolomini d’Aragona, a direct descendent of Enea Silvio Piccolomini (Pope Pius II), and Elda Ciacci. Today, the Bianchini family owns the Estate. Guiseppe Bianchini managed the farm for the Countess Ciacci Piccolomini. He lived on the land with his family and oversaw the day-to-day operations of food and wine production. His children were born on the Estate, and grew up in the vineyards and olive groves with their father. Guiseppe was willed the property in 1985, when the Countess passed without any heirs. Prior to this, the farm made wines for personal and local consumption. The Countess was never interested in making Brunello for the larger market. However, it had always been a dream of Guiseppe's to produce great Brunello. After selling a portion of the Estate to pay for inheritance taxes, he set about farming the most perfectly situated plots of land for classic Brunello production. In 2004, when Giuseppe passed, his children, Paolo and Lucia, continue to farm the land with great care and incredible results. Of the 200 hectares in Montalcino, 40 are planted to vine. They farm organically, without the use of chemicals or pesticides. Nestled at the base of Mount Amiata, the terroir is moderated by proximity to the volcano and the Orcia River. This extends the growing season and, coupled with the well-drained, rocky soils, leads to wines of great finesse, balance and longevity. Like many of the great producers of Italy, Paolo and Lucia are modern in the vineyards, favoring low yields, using cover crops and working the vines manually. In the cellar, the Sangiovese-based wines are classically styled, employing large oak and cement with wonderful results. The wines are quintessential expressions of place and the nobility of Sangiovese. 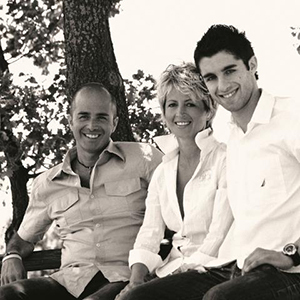 Of course Ciacci is best known for their eponymous single-vineyard Brunello, Pianrosso. One of the most noteworthy crus of Montalcino, the wine is a force, with great power, depth, and elegance. Made only in the best vintages is the Riserva; bottling of Pianrosso. The vintage Brunello is from entirely Estate vines, and is one of the best values in Brunello today. A classic expression of both Montalcino and Ciacci, the wine combines grace and power with a lovely drinkability. Ciacci Rosso di Montalcino is a textbook example of great Sangiovese and baby Brunello. It is pure and focused with complexity and immediacy. The integrity of the wine is unquestionable. Ciacci also crafts a tremendous little IGT Rosso that offers unparalleled value. 85% Sangiovese with a balance of Merlot, Cabernet Sauvignon, and Syrah, it is a perfect everyday wine.